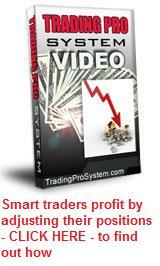 Some time ago, I purchased the Winning Trade System video series after receiving an email offer from the creator of the very successful Trading Pro System. Since I had been so impressed with the original course, I decided to buy it, primarily because it was promoted as "the sequel". Some very impressive profit numbers were presented in the advertising material, taken from sceenshots of David Vallieres' ThinkorSwim brokerage account. When you see them, believe me, you want to know how to make that kind of money! The system comprises 16 training videos and is highly analytical in nature. Once you get past the obligatory "introduction to options for those who don't know much about them" videos, it explores various factors that need to be taken into account, in terms of strike price, expiration date and "the greeks" in order to choose the optimal trade. By "optimal" I mean a trade that will produce a good profit while at the same time, allowing you the best buffer against loss, should the price action go against you. You may have heard that "option spreads" are the way to reduce risk, but using this technique, you can avoid the need for them - and the extra brokerage fees that spreads accrue. The Winning Trade System also delves further into stock chart analysis and compares price action against other indicators to predict the future of the market. It also explains what it calls "the breadcrumb trail" and two important clues you must always observe. Building upon these foundations, you move on to apply specific strategies for high and low volatility environments including how to adjust your trading strategy to suit. In connection with this, there is further instruction about "the greeks" and in particular, the relationship between the "gamma" and "vega". It is about understanding the clues that help you spot easy, profitable trades. A specific example is provided for assessing the purchase of a put option in a real life trading situation. The correct setting of stops and alerts is also covered. Next, you're taken into the world of company takeovers and the strategies you can employ when this is in process. Finally, the Winning Trade System explores a strategy which it claims, is being used by only one percent of traders. It is called "ratio trading". The final three videos explore ratio trading in depth, with some final advice on trading safely and profitably. All in all, I found the Winning Trade System to be an eye opener about some areas of option trading that I had never considered. If you like a simpler approach to trading options in preference to the more complicated and exotic setups, this system is the one for you. It combines simplicity with optimization for the best results.